24v Phantom on Schoeps CMC? Re: 24v Phantom on Schoeps CMC? Umm... Let me see if i can (try to) clear things up a bit for you. And see the attachment below as well. Due to the configuration of the output stage, the Schoeps circuit needs to be phantom powered. If you want to power a mic from a battery but not phantom-powered, you need another arrangement. Now you need to define more clearly your project. What is the mic going to be connected to? Balanced or unbalanced inputs? What cable length? What SPL? Basically, got a pcb on the Schopes design (ish)...got a capsule (not Schopes but could work). The pcb is designed similarly as below. I thought if I change a few components accordingly, could work with a 9 V battery cnsidering tha capsule is an electret capsule require approx 3V, / 0.003A. I could be completely wrong tho..i thought it could work as it is a very simple circuit? thank you for your help, I value your opinion and advise ! The output stage on this design depends on phantom power passing through the transistors. You'd have to rearrange the emitter followers and capacitor couple their output for this to work off a single 9V supply. Electret capsule + Schoeps circuit = "Alice" mic (lower half of the image below). Although the small capsules (ie. 1/4" ones) with the built-in JFET, with a bit of care, could have the "Linkwitz mod" applied (ie. where you separate the pad that goes to the case, so you have a part where the internal JFET source is, and a part that goes to the casing). That being said, what's this microphone (circuit) supposed to plug into? into a mic preamp...XLR.... just like any other electret or condenser mic...? It's only a coincidence that that particular resistor just happens to have the same value (6.8k) as the accepted standard for the phantom-power feed that's inside most microphone preamps today. That resistor-zener regulator is there to provide a fixed voltage for the JFET impedance-converter (ie. a set of fixed / controlled operating conditions). 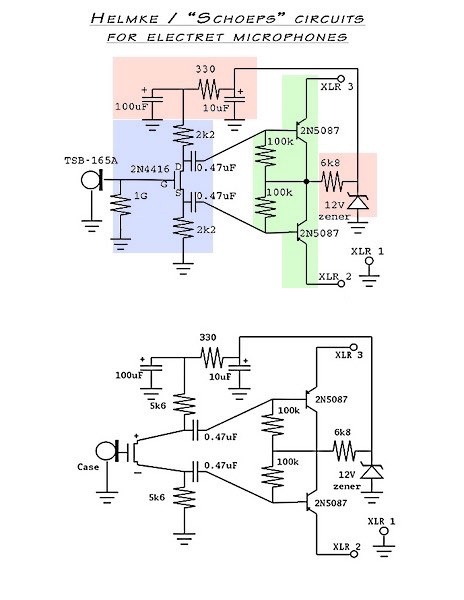 Even if you provide 9v across that zener, without the phantom-power feed, the audio signal will only go as far as the bases of the two PNP transistors there. Most solid-state condenser mics are designed to accept the 48v phantom power coming from the preamp (see my earlier links). While it's true that there are some condenser mics that can be powered with batteries (some shotgun mics come to mind), those are usually designed for "field use" anyway (where preamps that provide phantom-power may not be available) and is highly unlikely they use the Schoeps-style circuit, plus they most definitely(?) have some form of DC-DC converter inside, to turn the battery voltage (thinking of a 1.5V AA here) into a more appropriate value for the circuitry. Although speaking of which, you still haven't answered my "intended application scenario" question. I stand to be corrected, but that "3v on the capsule" is, at best, some rule-of-thumb type value. It's a pretty safe bet the JFET inside that is rated for at least 20v (drain-to-source) anyway. What electret capsule is that, by the way? A few years ago i hacked together a mic with a Linkwitz-modded Panasonic WM-61A and a Schoeps-circuit (ending up, in essence, with an Alice circuit). I just opened it up and measured, and i read about 6.2v between the drain and the source (ie. between the "inside" ends of the 2.2k resistors). I seem to have used a 9v or 9.1v zener, and after the RC filter on the power rail, end up with 8.8v applied on the "top" end of the drain resistor. Indeed there are many possibilities for a battery-powered microphone, which would be much more efficient than stepping up to 48V and stepping down to the 3-10V required for proper operation of the capsule. There is one solution that involves only two components, one resistor and one capacitor; the output would be unbalanced, but perfectly usable for short (about 5 meters) cable runs. With one more R and one more C, it would be impedance-balanced, which would make it suitable for somewhat longer cable runs. ooookay....thank you...but what do you mean by one more R and one more C? i have ordered two pcbs...one for fun to just try out what this would do/ sound if I follow the circuit but changing the voltages according to the capsule.. I am just throwing my 5 cents here...i love these discussions...opinions...and results...if any..
greetings to you all from Budapest! ooookay....thank you...but what do you mean by one more R and one more C? need 18V and 24V from 24V. PS?